Melbourne has enjoyed a beautiful weekend! Winter was farewelled, and has been spring ushered in with sunny, warm days with temperatures in the low 20’s. It won’t last, of course – it’s Melbourne! – so you’ve got to make the most of it while it does. 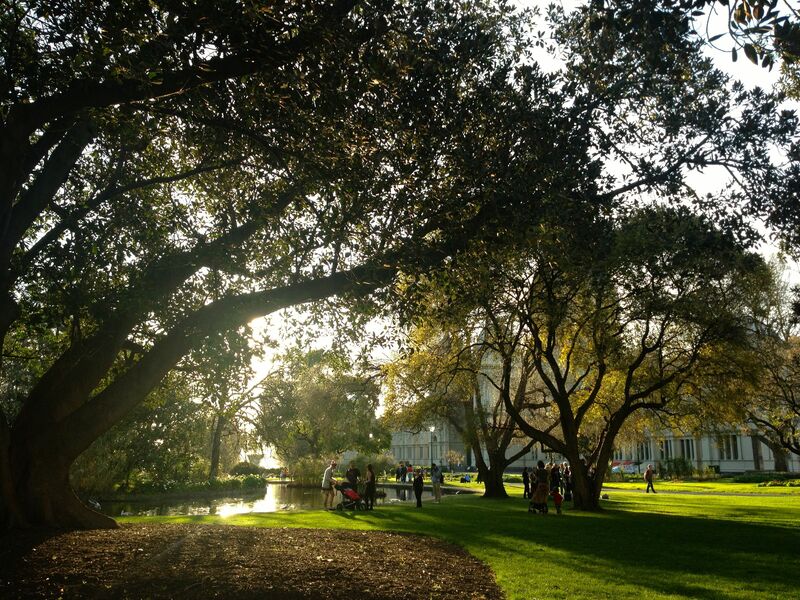 One of the things I love about Melbourne are the parks and the way people get out and use them. Since spring has seemingly decided to arrive (or tease us) earlier than usual this year, we decided to go back up to the National Rhododendron Gardens, near Olinda on the Dandenong Ranges east of Melbourne. Having been earlier in the year to see the leaves change colour in autumn, we thought we’d go back to see the cherry blossoms in the Cherry Tree Grove. 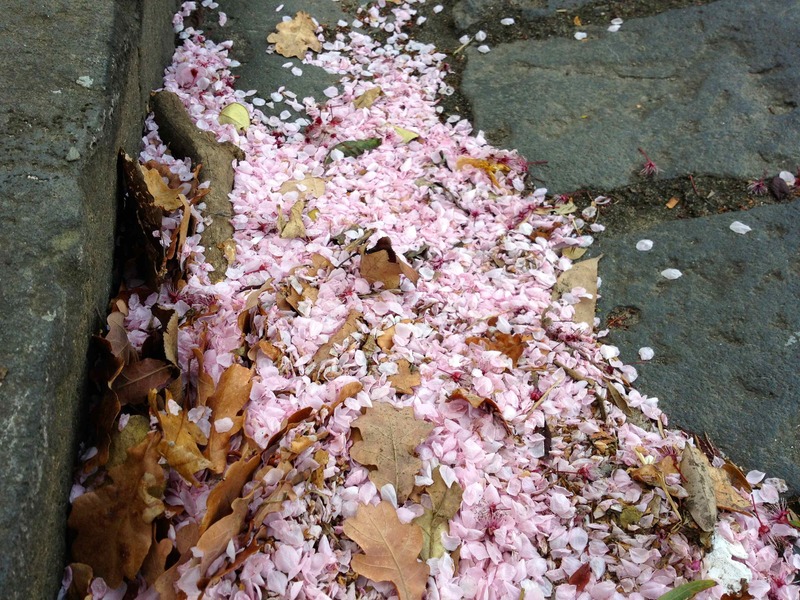 Petals in the gutter outside our house & there are plenty more along the footpaths – surely we should go up to see the cherry tree blossoms before we miss out? Unfortunately we were a little eager – the climate around the Dandenong Ranges is cooler than Melbourne, so even though the tree outside our house has almost lost its flowers and is looking like it’s got most of its leaves back again, the cherry trees up on the mountain are only just budding. Although the cherry trees might be taking their time waking up from winter, other plants like magnolias, daffodils and azaleas have been busy putting forth their blooms. Very common through the gardens. Don’t know what they are, but they’re gorgeous! Another editing experiment – too much? Some blossoms! Not cherry, though. I didn’t know they came in such a magnificent colour! There also seemed to be more native birds around than last time, too. It’s always a treat to spot and identify them, too, even if it’s ‘just’ a fairly common New Holland Honeyeater or Eastern Yellow Robin. All up, a lovely day out. Categories: Victoria, Weekend Drives, Weekend walks | Tags: Dandenong Ranges, Magnolia, Melbourne, National Rhododendron Gardens, Olinda, photography | Permalink. Still in pursuit of trees with leaves changing colour to photograph, Stephen suggested that we visit the National Rhododendron Garden at Olinda in the Dandenong Ranges east of Melbourne. He was tipped-off by a post on Parks Victoria’s facebook page. The gardens are well sign posted, so easy to find. Fortunately we found a car park once we arrived. The mountain ash around the car park are stunning by themselves, even though (being eucalypts) they don’t change colour. It’s easy to walk in the entrance (which, unusually for a Victorian Park, is through a gift shop) and get awed by the view and forget to keep walking. Luckily Stephen was there to prompt me to move on. There is a lot more to see. Even though I’m categorising this (for now at least) as a weekend ‘walk’, I didn’t think of it as a walk, per se – more just a photo opportunity! We followed the main loop track and probably only walked about 2km – give or take. There’s a map on the Parks Victoria page (linked above). We will have to go back in spring when the Rhododendrons are in flower – that looks beautiful, too. Categories: Victoria, Weekend walks | Tags: autumn, Dandenong Ranges, fagus, maple, Melbourne, National Rhododendron Garden, Olinda, Parks Victoria, picnic, Victoria | Permalink.